So I’m back this week with the second half of my Too Faced X Kat Von D Better Together Collection review and makeup tutorial! At this point of time, I feel obliged to let you know all that I am (obviously) not a makeup artist, just a regular ol’ vainpot who loves experimenting with makeup! When I was sent this collection, my initial thought was “YES, I LOVE TOO FACED” and I was really excited about receiving the set. Pretty sure the courier guys can attest to that fact as I called them up to check on the delivery status like, countless times. So when I finally got my grimy hands on the set and cracked it open to see those beautiful pinks and creams, I was honestly so happy, because that is like, my thing, you know? This palette has ignited my love for warm coppery shades, and now I can’t seem to stop shopping for peach based palettes. Just acquired Kylie Cosmetics royal peach palette last night via the website and I can’t wait for it to come! My first ever Kylie purchase! Back to this palette – I really like ‘Friendspiration’ , way more than I thought I would! I used to stick to cooler based neutrals and pinks for my eyeshadows, and I can’t believe it took me so long to realize that warm neutrals ain’t that bad on me at all. Not at all. This candlelight glow highlighter came as part of the Better Together Cheek & Lip makeup bag set, and I am loving the packaging! 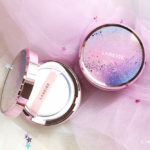 This is so freakin adorable and its little size makes it just perfect to throw into your purse for any highlight touch ups! So anyway, here’s my makeup video of the week, using only the Too Faced side of the palette to create my eye makeup! Do watch it, and give it a thumbs up if you enjoy it!